I vaguely mentioned in Part 1 of this blog series on monitoring that there is a collectd alternative for windows. Indeed, there is, it's called SSC Serv and can be found here. It works with the collectd protocol and has the same collection module architecture so it is a defacto port of the unix collectd for windows. Here's the catch, it's not free. It's not that expensive so it may be worth the money for enterprise customers but there is another catch: Windows has it's own Performance Monitoring suite that Windows administrators are usually already comfortable with; the Windows Performance Monitor built into every Windows platform. Windows Performance Monitor doesn't do Java performance metrics, whereas collectd does, so we'll need to augment it with another solution for collecting those, we are going to use JMXTrans for that. 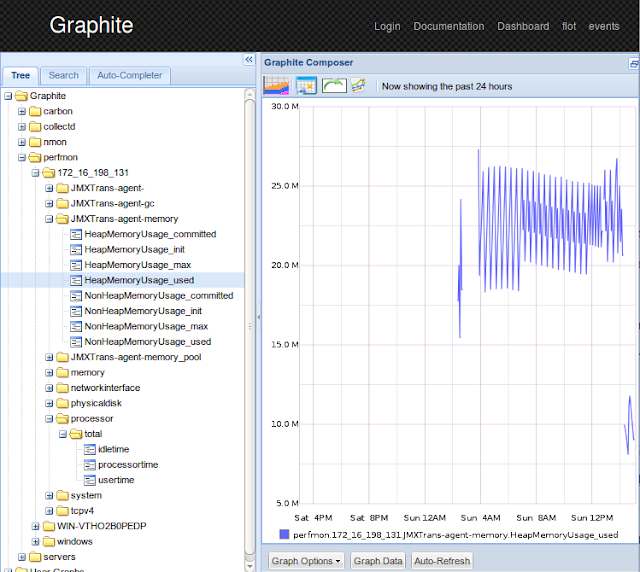 JMXTrans is a JMX monitoring solution that converts JMX the the graphite metrics protocol. 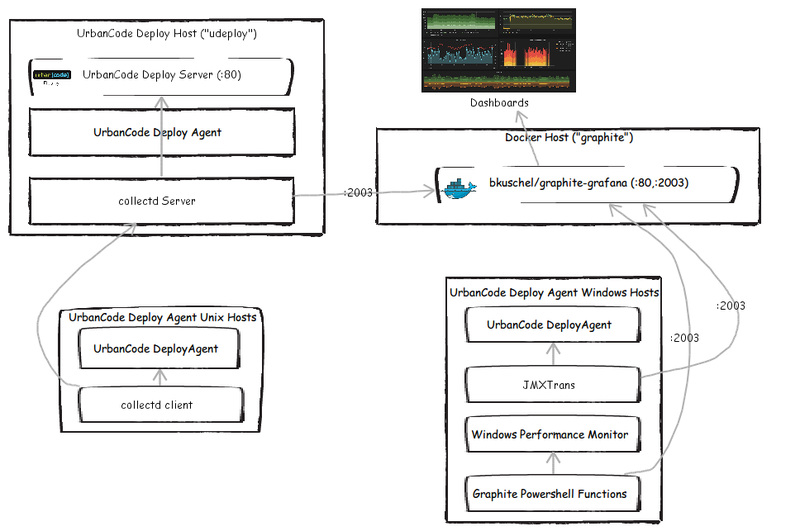 Window Performance Monitor does not "speak" the graphite metrics protocol so, we also need something to translate that, we will use custom PowerShell functions to do that and run them as a windows service. Will use a powerful windows service manager called the Non-Sucking Service Manager (nssm) for that. 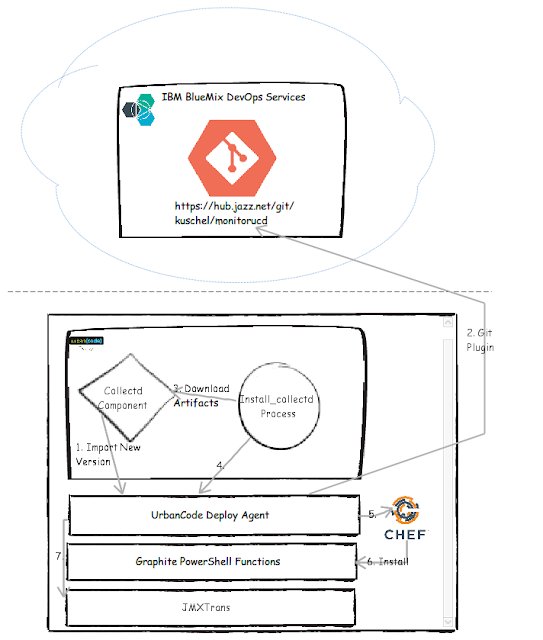 And Chef cookbook to install Graphite PowerShell Functions based on this one. Import the Generic process in the same way as described for the collectd generic process in Part 1. The process paramaters are also similar, though as our process only supports agents and there is no client/server architecture, there is a much smaller subset. Graphite Server: The Graphite server we are connecting to. powershell.exe -NoLogo -NonInteractive -command "(New-Object System.Net.WebClient).DownloadFile(\"https://opscode-omnibus-packages.s3.amazonaws.com/windows/2008r2/x86_64/chef-client-12.4.1-1.msi\",\"chef.msi\")"
msiexec /log msiexec.log /qn /i chef.msi ADDLOCAL="ChefClientFeature"
Create Graphite Powershell Node: This works similar to the collectd install described in Part 3 except that the configuration files generated in this case are used by the PowerShell functions. 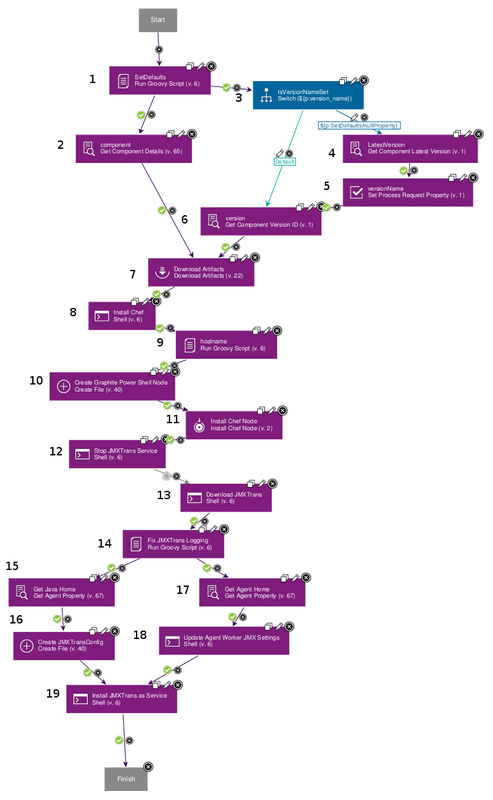 powershell.exe -NoLogo -NonInteractive -command "(New-Object System.Net.WebClient).DownloadFile(\"http://central.maven.org/maven2/org/jmxtrans/jmxtrans/251/jmxtrans-251-all.jar\",\"jmxtrans-all.jar\")"
Get Java Home: Gets the Java home of the agent used to launch JMXTrans. If new queries are added, make sure to add to copy the outputWriters attribute over also use a resultAlias that starts with JMXTrans-agent- (or JMXTrans-server-) to keep metrics consistent. Get Agent Home: Fine the Agents home directory. Update Agent Worker JMX Settings: Update the UrbanCode Deploy agent worker jvm so that remote JMX is enabled.